I use Vim as my main text editor. It's ubiquitous. I have a minimal .vim/ setup. It moves around with me easily, as long as I have ssh and git, I can get comfortable on a host very quickly. I needed a way to access the most recently updated files. :bro old is painful to use. Here is a vimscript function that pipes the output of :bro old in a file then lets you roam in it with j and k and then hit <space> to open a file. Use the standard ctrl-6 or ctrl-^ to get back in the file list. It also outputs the result of :buffers, so you're presented with a list of currently open buffers followed by a list of recently opened files. I find it convenient for quickly navigating or getting back into context. The original is at https://github.com/jmettraux/dotvim/blob/fe1d1c3f/vimrc#L346-L390. I move up and down with k and j and hit space to open the file under the cursor. I hit ctrl-6 (;; in my setting) to get back to the list of files. 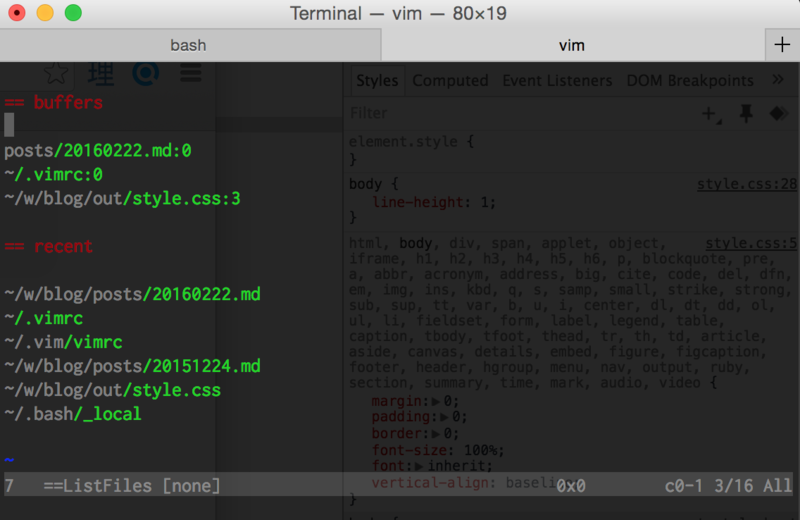 to my .bashrc so that vo fires up Vim directly in this list of files. This script is condensed from a series of google searches and stackoverflow scans. I felt like quitting in the middle, but there is always an answer somewhere that unlocks it all.